Nyjer, niger, or thistle seed: just what is the little black seed that small birds find irresistible? Learning more about nyjer seed will help birders realize just how important this type of birdseed is for their backyard buffet. The seed of the African yellow daisy, Guizotia abyssinica, Nyjer is known by many names. The birdseed was originally called niger in reference to Nigeria and the plant’s geographic origin. The name was trademarked as Nyjer ® in 1998 by the Wild Bird Feeding Industry, however, to clarify proper pronunciation (NYE-jerr). 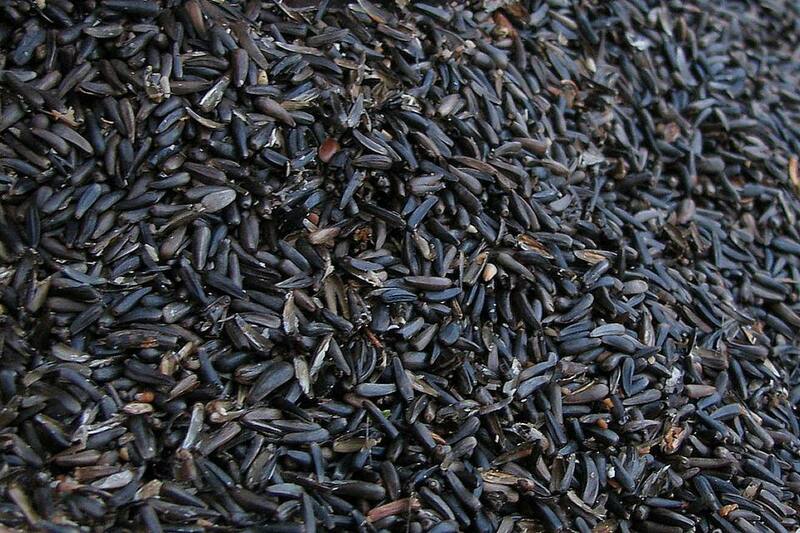 Many birders also call it thistle seed, but Nyjer is not related to thistle plants, flowers, or seeds. It is believed that calling the seed thistle may have become popular because goldfinches, which adore Nyjer, also feed on thistle and use thistle down to construct their nests. In parts of Africa, this seed is also called blackseed and inga seed. Commercial Nyjer is grown in Africa, particularly Ethiopia and Kenya, as well as in India, Nepal, and Myanmar. In some areas the oil and seed are eaten in different recipes, including curries, chutneys, and gruel, and Nyjer has several medicinal uses as well. The most widely known use is for feeding birds, however, and the seed is imported around the world as a popular type of birdseed. Before it is imported, however, Nyjer seed is sterilized by intense heat to prevent germination of any additional seeds that may be part of the mix. This is required by many countries to prevent the introduction of invasive weeds or other unwanted plants into the environment. Treated Nyjer may germinate but would typically be stunted, limiting its spread and offering less of a threat to native plants. Because of this composition, Nyjer is especially popular as a winter bird food, when birds require foods with more oil and a higher calorie content so they can store fat to survive colder temperatures. The high protein content in Nyjer is also useful for regenerating feathers when birds molt in the late fall and early spring. While all these birds will enjoy Nyjer if it is offered, not all of them will eat it exclusively. Goldfinches, redpolls, and siskins, however, will often eat nothing but Nyjer if it is readily available. Because of import taxes and the cost of sterilizing the seed, Nyjer is one of the most expensive types of birdseed to offer. Buying Nyjer in bulk is often more cost effective than smaller quantities, and excess Nyjer can be safely stored for weeks in a cool, dry place. Birders can make the seed even more affordable by adding Nyjer to a birdseed mix rather than feeding it straight. Another popular option is to offer Nyjer in specialized feeders to prevent spills and restrict access to the seeds to only the most desirable birds. Tube feeders with narrow feeding ports, wire mesh feeders, and mesh socks are popular Nyjer feeder designs perfect for small, clinging finches but less suitable for larger birds that may empty feeders more quickly. While Nyjer seeds do not typically sprout, the biggest problem with feeding Nyjer to backyard birds is the mess the hulls will leave beneath feeders. A thick coating of small black hulls can choke off grass and plants. While ground-feeding birds such as quail and juncos will appreciate spilled Nyjer, it can be frustrating to see these expensive seeds littering the ground. Adding a platform beneath the feeder or choosing a feeder design with a wide base can minimize spilled hulls and loose seed, or birders can put a screen, newspaper, or an outdoor rug underneath feeders to catch spills. Choosing a heavier feeder can also prevent seed from spilling in stiff breezes or winter storms. Nyjer is a great seed to offer finches and other small seed-loving birds. By understanding why this seed is so popular, it is easy to offer it in the yard and enjoy the different colorful and energetic birds it attracts.